Some Believe That This Historic College May Be One Of The Most Haunted Schools In The Midwest. What Do You Think? Illinois College was founded in 1829 by Reverend John M. Ellis, a Presbyterian minister who felt a "seminary of learning" was needed in the new frontier state of Illinois. His plans came to the attention of a group of Congregational students at Yale University. Seven of them, in one of the now famous "Yale Bands", came westward to help establish the College. It became one of the first institutes for higher learning in Illinois and the first two men to graduate from a college in state were Richard Yates, who became the Civil War governor of Illinois and later a U.S. Senator and Jonathan Edward Spilman. This second graduate composed the now-familiar music to Robert Burns's immortal poem, "Flow Gently, Sweet Afton". 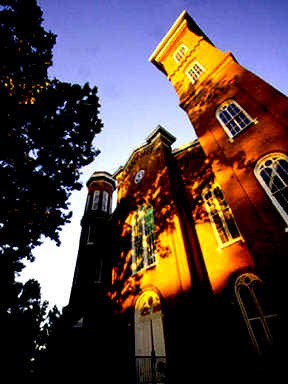 Both men received their baccalaureate degree from Illinois College in 1835. Sturtevant Hall at Illinois College. Nine students met for the first class on January 4, 1830. Julian Sturtevant, the first instructor and the second president, reported, "We had come there that morning to open a fountain for future generations to drink at." Shortly after, Edward Beecher left the Park Street Church in Boston, Massachusetts, to serve the new college as it first president. He created a strong college and retained close intellectual ties with New England. His brother, Henry Ward Beecher, preached and lectured at Illinois College, and his sister, Harriet Beecher Stowe, was an occasional visitor. His brother, Thomas, was graduated from Illinois College in 1843. Ralph Waldo Emerson, Mark Twain, Horace Greeley, and Wendell Phillips were among the visitors and lecturers in the early years. In 1843 and 1845 two of the College's seven literary societies were formed. Possibly unique in the Midwest today, the societies have continued in their roles as centers for debate and criticism. Abraham Lincoln was one of many speakers appearing on the campus under the sponsorship of a literary society. Illinois College also became heavily involved with the abolitionist movement as President Beecher took a very active role. At one point, a group of students was indicted by a grand jury for harboring runaway slaves. Illinois College was also a well-known station on the Underground Railroad and a number of tunnels can still be found under the college, leading to the Smith and Fayerweather houses on the campus. In the years following the Civil War graduates contributed with distinction to the national scene. Among these was William Jennings Bryan, '81, who within 15 years was the Democratic candidate for the U.S. presidency in the race with McKinley. He continued with a prominent role in politics even after the election. There were many other famous and prominent graduates of the school over the years and it has maintained an outstanding scholarly program. Not surprisingly, it has maintained close ties to the supernatural world as well. Like with many other historic spots in Illinois, the events of the past have certainly left their mark on Illinois College. Many of these events still come back to "haunt" students and faculty members today and there are many who have encountered this ghosts of yesterday face-to face. One place where strange events have been reported is in Beecher Hall, which was built in 1829. This two-level building is now used as a meeting hall for two of the school's Literary Societies, Sigma Pi and Phi Alpha. The Sig's meet on the upper floor and the Phi's meet in the lower part of the building. The majority of the encounters here seem to involve the groups who frequent the upper floor. The most commonly reported events are ghostly footsteps that can be distinctly heard in one room, always coming from another. If the witness follows the sound, then the footsteps will suddenly be heard in the other room instead. Years ago, this was a medical building and cadavers were stored on the upper floor. Some believe that this may explain the ghostly activity. Beecher Hall at Illinois College. Legend on campus has it that the students here were not actually supposed to have the cadavers that were secreted away in the building. However, they were so dedicated to collecting medical knowledge that they stole them from local hospitals and cemeteries, introducing the art of "body snatching to Illinois College. The corpses were hidden in the attic until the stench of decaying flesh alerted college officials to their presence. 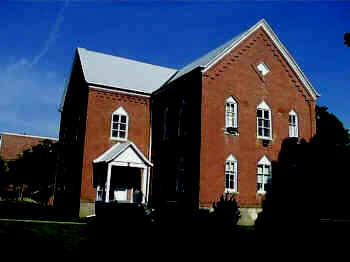 Other legends claim that the ghost here is that of Williams Jenning Bryan, who has returned to haunt his old school. He was a member of Sigma Pi and was often in the building during his years at Illinois College. There are others who say that it might be Abraham Lincoln's ghost instead. He was an honorary Phi Alpha and while he did not attend the school, he did speak at Beecher Hall on occasion. 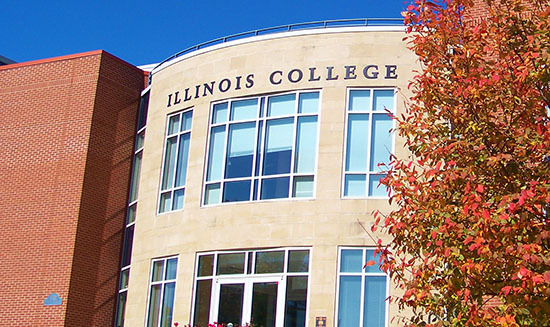 In addition, William Berry (Lincoln's partner at new Salem), William H. Herndon (his law partner), and Ann Rutledge's brother, David, all attended Illinois College. Another allegedly haunted spot on campus is the David A. Smith House, which was built in 1854. Today, the structure is home to three of the women's Literary Societies, the Gamma Deltas, the Chi Betas and the women of Sigma Phi Epsilon. There is a parlor for all of them but the Delts use a room on the main floor while the Betas and the Sig Phip's have rooms on the second floor. The attic is used by all of the groups but there is also a dining room, a kitchen and an apartment at the back of the house. 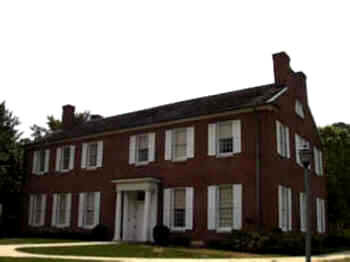 The Smith House at Illinois College. There are several versions of the historic legend concerning the ghost in this house, but all of them claim that she is the daughter of the original owner and that her name was Effie Smith. Basically, Effie was being courted by a young man from town and they became engaged. When he proposed to her, he gave her a diamond ring and she was said to have scratched it against her bedroom window to see if the diamond was real. When she realized that it was, she etched her signature into the glass and her name remained for many years afterward. The window has recently been removed and this small and unusual piece of history has been lost. Then, the story begins to take different paths. In one version of the story, David Smith was very disapproving of his daughter's new fiancee and he literally locked Effie into a closet one day when the man came calling. Fearful of her father's wrath, the young man hid himself in a small room that was only accessible from the attic. For some reason, he nailed himself in to escape from David Smith and he later died there. According to students who have been in the attic, the nails are still visible there today, nailed from the other side of the door! When Effie learned of her lover's cruel fate, she threw herself from an upstairs window and died in the fall. In the second version of the story, Effie's young man went off to fight in the Civil War. Every day, Effie climbed up to the attic and watched for him to return. When she later learned that he had been killed in battle, committed suicide by once again, jumping out of the window. Another variation of the legend has Effie being jilted by her lover and she again commits suicide. Regardless of what happened, the story stands that she killed herself and has since returned to haunt the house. Effie's rocking chair is still located in the attic and the stories say that if you move the chair away from the window (where it sits, facing out), leave the attic and then return later, the chair will have returned to its original position. This window is located in a storage area for the Chi Beta society and every year, they frequently test the chair and discover that the story is true! One young woman even walked into the room one day and the door suddenly slammed closed behind her. It is also not uncommon for cold air to suddenly fill this room, even though for years, the windows were painted shut. It was said that ice cold wind would often come from the window with Effie's name etched on the glass. Another interesting feature of this building is the tunnel that once exited from the dirt basement. This tunnel was once supposed to have connected to other buildings on campus and was said to have been used during the years of the Underground Railroad. As operations connected with this abolitionist system were always kept secret, and no records exist, no one knows for sure if the stories are true. Today, the tunnel is boarded up and remains only a curiosity of times gone by. Another reportedly ghostly location is Whipple Hall, which was constructed in 1882. The spectral occupant of this place is known only as the "Gray Ghost". The upper part of the building serves as a meeting hall for the Alpha Phi Omega society, for the Eta Sigma chapter, which is a national service fraternity, and as the location of the security office. The lower part of Whipple is the meeting hall of the Pi Pi Rho Literary Society. The basement of the building is only accessible from the outside and is divided in half. One side of it was once a classroom when this was Whipple Academy, a college prep school. Strangely out of place chalkboards still remain on the walls. Whipple Hall at Illinois College. Perhaps the most famous sighting on campus of the "Gray Ghost" occurred to a girl who was leaving a Pi Pi Rho party one night and had to retrieve something from the Alpha Phi Omega hall. She had been drinking (but later insisted that she was not drunk) before she started climbing the curved staircase. As she reached the middle of the curve of the stairs, she looked up to the top landing and saw a man standing there. He was all dressed in gray and she quickly realized that he was not a security officer. As she peered a little closer into the shadows, she also realized something else... that he had no face! She began screaming and ran back down the staircase and out of the building. Due to the noise of the party, no one heard her though and the revelers wouldn't learn of the strange experience until later. Other students and alumni of Illinois College have contacted me to say that the girl who haunts room 303 was actually a young woman named "Gail", who died of natural causes in this room. Apparently, her parents were aware that she was terminally ill when she went to school but as attending college had always been her dream, they allowed her to go anyway. She died while living in Ellis Hall and a small plaque is mounted on the door of the room in her memory. It is said that her ghost is a mischievous one, opening doors and hiding things. Local legend has it that third floor residents have often said that if they lose anything, they will ask Gail aloud to return it. The missing item is usually found a short time later. A former student of the college, who lived for two years in Ellis Hall, wrote to tell me of experiences that she had while living below the "haunted room". She said that she often heard knocking sounds coming from the other side of the wall, even though there was nothing there. It was the outer wall of the building and there were no trees nearby. There are other places too, but stories from some of these sites are much more sketchy. One of them is Fayerweather House, a residence hall for women. It has been said that windows and doors operate on their own here and that lights turn on and off without explanation. Perhaps most strange are the stories of "grave-shaped" depressions that sometimes appear in the dirt floor of the basement. Some have suggested that perhaps the building may have been constructed over a burial ground, but no one really knows for sure. 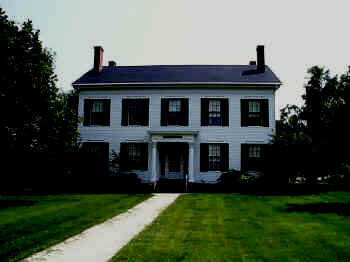 Fayerweather House at Illinois College. I have been informed that the girl who allegedly hanged herself in the closet once resided in this house. In fact, she committed suicide in the closet of Room #5, which is located on the stairway landing between the first and second floors of the house. "Susie", as she has been called, is noisy and can often be heard walking around the house, opening doors in the middle of the night and scratching on walls. One correspondent informed me that Susie was once blamed for the violent removal of a clothing rod from the wall. They could never explain how this had happened. The stories also maintain that the attic of the Fayerweather house has been fully converted into dorm rooms, but they are never used. It has been said that the rooms were closed when too many strange things started to happening to the students who lived there. One of my correspondents had a sister who lived in Fayerweather and told her of doors slamming and lights turning on and off, as well as objects that would fly about in the rooms. Another site is Sturtevant Hall, one of the most famous spots on campus. 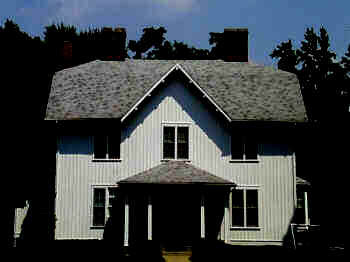 Recent stories say that a ghostly young man in a Civil War era uniform is sometimes seen here. In addition, it is nearly impossible to find someone who will spend the night in the north tower of the building. It has been said that there are too many sounds and noises here to get anyone to do so. Before it was made into classrooms, the building housed the Pi Pi Rho Literary Society. Members of the society still maintain that toilets in the hall often flushed by themselves. 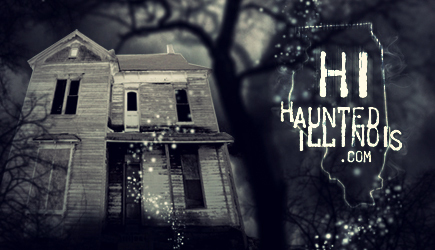 Crampton Hall, which was built in 1873, is also believed to be home to a ghost. The residence was built to house 69 men and it was named in honor of Rufus C. Crampton, a former professor and president of the college. According to the story, there was a male student who left a party one night and was later found in his room (again) having hanged himself in the closet. However, it was always said that he was found hanging in such a way that he could not have done it himself! His former room is now believed to be haunted. And apparently closets in Crampton Hall are as mysterious as the stories that revolve around them. One student told me that one day three of the residents were waiting on a fourth friend to get ready so that they could all go somewhere together. Finally, they tired of waiting and went to check on him, only to find that he was hanging upside in the closet, stark naked, and so frightened that he was almost incoherent. The student went on to say that he lived in this building for one semester and "would never live there again". One night, he fell asleep with his lights on but was awakened by a noise. When he looked up, he saw a man standing there looking at him. The man quickly turned and vanished into the closet. Another resident haunt can be found in the McGaw building. This is a performing arts building and it has been reported that you will never find anyone alone in the auditorium alone here at night. The place is allegedly haunted by the ghost of a man who is seen wearing clothing from the 1940's. He is usually seen out of the corners of the eyes of those who are on stage. Rammelkamp Chapel allegedly has a haunted basement as well. Some of the students tell stories of classroom doors and that open and then slam shut, sometimes in the middle of lectures. The classrooms are located on both sides of a long hall here and by looking out the door of one of them, a person can see into the classroom across the hall. One day, during a class, a student reported became quite upset when she looked across the hall and spotted a woman in white in the adjoining classroom. This would not have been so strange had the woman not vanished before her eyes! © Copyright 2000-2010 by Troy Taylor. All Rights Reserved. Special Thanks to the Students at Illinois College who have already assisted with this Project!